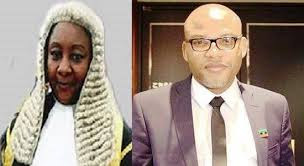 BIAFRA: STANDARDS AND JUSTICE -THE ONLY ESCAPE ROUTE FOR JUSTICE BINTA. Fair and impartial courts protect the rights of everyone and grants the fundamental promise of justice to all. Unlike the executive and legislative branches of government, which are necessarily political in nature, the judicial branch was designed to be as insulated as possible from politics and public pressure. When people approach the court to resolve disputes, they should have confidence that the judges deciding their cases will act in a neutral manner. They should not worry about whether judges are being guided by influences from outside the courtroom, regardless of how loud or powerful these influences might be. They should be able to trust that justice will be determined by the law and established facts of their case, regardless of the social status, income, race, beliefs of the prosecutor or defendant (as the case may be). There should be equal opportunity to be heard. The main duty of every judge is to know the law and to apply the law correctly, so as to ensure that the case or controversy is decided in a fair and impartial manner. Judges also consider the evidence and determine the key facts in a case or controversy. Whenever a case or controversy comes before a court, all persons who are parties have basic and constitutional rights to what is called 'due process. ' The concept of 'due process' of law is, at its core, is to be given fair notice of the specific claims or allegations being made; the right to be given a meaningful opportunity to present all the evidences and arguments in support of one’s case, and the right to have the factual issues decided by a judge or jury who will decide the case fairly, impartially and in accordance with the rule of law. If a judge does not follow the law, and makes rulings according to personal, political or religious views, then that judge is unfair and partial. If a judge is not fair and impartial, then one or both parties are denied their fundamental and constitutional right(s) to due process of law. Judges who are not fair and impartial, not only violate their oath of office but also undermine the careful balance of power among the three branches of government as established by the Alaska Constitution. Judges, like most of us, have opinions and may lean toward one party or another. Judges may or may not be religious, and there are certainly a lot of different faiths a judge might adhere to. Judges have hobbies,philosophies of life, likes and dislikes, and are thus, individuals and citizens like the rest of us. Nevertheless, a judge must uphold the law fairly and without bias or prejudice. When a judge enters the courtroom, his or her personal, political and religious beliefs must give way to the Rule of Law. With this in mind, the Indigenous People Of Biafra, IPOB, urges Justice Binta Nyako to uphold these standards of Justice and ensure that Muhammadu Buhari's pressure on her does not influence judgement.